So by the 0.1 db criteria, would you say this DAC had a 0 bit resolution? That's even worse than the bifrost! That was of course, tongue in cheek there. However, I was attempting to make a point regarding that criteria used to intepret ENOB without considering SNR. You either have a 0 bit dac which should be HUGELY audible or you don't. In which case, the criteria or at least intepretation of ENOB may need refining. I had the opportunity to listen to both the 105 and the 205 on several occassions in an environment I am familiar with. First to my great surprise the 205 had less features like streaming services compared to the 105. I thought the 105 had a very nice set of features offered including the major video streaming services. The other was that I preferred the 105 in its sound. However both of them featured healthy doses of glare in the treble the 205 more so than the 105. The 205 was so glary that I couldn't stand to listen to more than a few songs on it. The 105 however with the right gear I could listen without much fatigue and have spent many hours listening to it. Though I couldn't help wish for something like the Gungnir MB's or the Emotiva' DC-1's smoother sound instead (both which I'd also heard in this setup). In use the 105 crashed frequently. Many many many times especially during streaming, and during switching apps. This was with the updates. The 205 has an HDMI return channel system which was very slow in its implementation. My friend and I would sit and just stare at the screen as it slowly tried to figure things out. Overall, it didn't leave a great impression of the player. However both players did deliver impeccable looking picture quality in both 1080p and 4k (where applicable) to a large projector screen. And I can't fault its picture. Yeh, I almost tried it by turning on the cursor. The criteria is actually working excellently. In this case it is showing that this device is completely broken and non-performant. No way should there be errors this early in that test. By other people's 3 or 6 dB criteria, this DAC is perfect since the error is almost +- 1 dB. Would they proceed and call it "excellent" as they did with the Schiit Bifrost Multibit? I sure hope not. Again, ENOB and SNR are tightly coupled, though ENOB contains more signal content, and static linearity is not the same test. Comparing the linearity to the SNR as set by quantization noise (only) of an ideal converter delivering a single sinusoidal signal provides a useful metric for comparison. You can generate ENOB from the linearity test but it is more of a "superset" of the DC linearity. I do not understand your point. The graph does not show 0-bit resolution; it does show significant deviation from linearity, however, that indicates a pretty fundamental problem. Whether it is due to the implementation, a bad device, or something else remains to be seen. 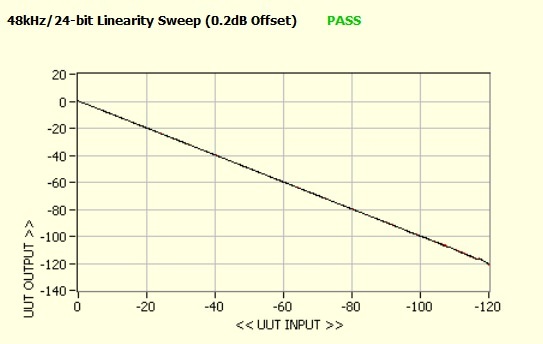 First I'd like to note that I have no problem of using linearity as part of a way to compare dacs. Obviously some dacs do way worse at linearity than others while some do exceptionally well. I think it's important to show that and use it to compare. Also obviously there's something wrong with the Oppo's implementation and your measurement has helped to show that. I also have no problem with saying "this dac goes to 10 bits with perfect linearity and then varies from perfect linaerity at greater than 0.1db." This is different than ENOB or saying this DAC only does 10 bits. I still don't know where the evidence or documentation for using the 0.1 db value to calculate obtaining that number of bits. Other than "it looks straight" and "+/- 1 lsb would be too forgiving", which isn't evidence or a documented method to obtain ENOB. Show me the words "0.1 db", "linearity" and "ENOB" together in some paper and I would be more convinced. ....And my intepretation here could be quite wrong. I'm still learning. DonH : What do you mean by "generate ENOB from the linearity test but it is more of a superset of the DC linearity?" I imagine they would. But you are right that they should perform the linearity test and note this issue. Because obviously there's a problem of some sort. How come all the other audio engineers have not published test measurements of linearity and sine waves for the Oppo 105? Amir, maybe your tests should be shared across the entire audio community? Would it make a difference? ...For the best. In practical listening sessions, blind tests, can experienced trained listeners hear and tell? Not every analyzer can measure it. And certainly it is a much more obscure test than THD, etc. I thought about using it because it goes to the core of what the DAC does. And the fact that DACs are very good with strong signals and it is the weaker ones that separates them. Hopefully awareness continues to increase and this test gets included elsewhere. Stereophile performs the sine wave test by the way, but not the linearity one even though they used to run it. I think it's yet another situation where the mainstream 'reviewers' have 'dumbed down' their objective measurements to appease the vast amount of space allocated for the subjective part of their reviews. That's why testing and publishing here is so valuable. In the late 80s, we had multiple measurements of low level linearity linearity in published reviews, using dithered, undithered, fade to noise and the classic stair step monotonicity tests- all there in their glory, made on the AP system 1 for Redbook. I don't think the required continual investment in test equipment and training kept pace with the developments in D/As in commercial offerings. Combine that with public apathy and disinterest in actual, verifiable test results and 'reviews' basically became puff pieces. Just occurred to me to ask, does the AP do this test with DC signals for the linearity? That output looks like a capacitor in the way. Some things (i.e. not all!) were, indeed, better in the olden days. No as that would require DC coupling. Instead it uses a 400 Hz tone (or is it 200?) that is bandpass filtered to substantially increase signal to noise ratio of the ADC. Then the RMS voltage is measured and used for deviation computation. A least squares line is fit to the deviations and errors relative to that are shown on the graph. I think JA measures linearity but doesn't publish a graph; he will mention it in the text though. That essentially follows the IEEE Standard. Welcome to the forum and good find. He doesn't say what input that is so there is still possibility of something being amiss with the S/PDIF input that I tested. Welcome to the forum and good find. Thanks! I really like the forum so far. He doesn't say what input that is so there is still possibility of something being amiss with the S/PDIF input that I tested. True, it only says the tested input is S/PDIF and not if its coax or optical. There are also separate measurements of the CD/SACD and DVD-A performance, but strangely nothing on the USB input.